Energy • They target project in eastern Utah; Chevron says it is not involved there. 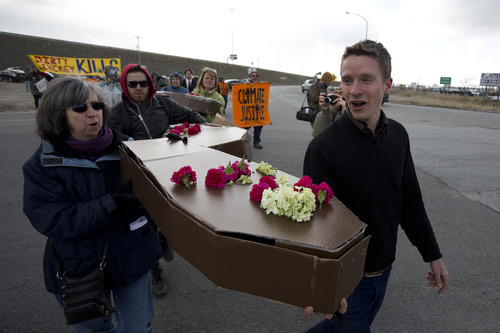 Lennie Mahler | The Salt Lake Tribune Protesters place cardboard coffins at the gate of the Chevron oil refinery in Salt Lake City demanding an end to oil extraction from tar sands, citing damage to the environment, wildlife, and public health. Saturday, March 23, 2013. 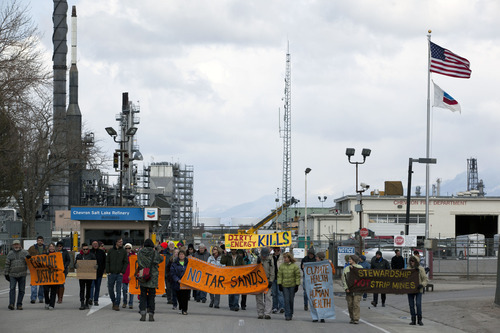 Lennie Mahler | The Salt Lake Tribune Protesters leave the Chevron oil refinery in Salt Lake City, voicing opposition to oil extraction from tar sands, citing damage to the environment, wildlife, and public health. Saturday, March 23, 2013. Lennie Mahler | The Salt Lake Tribune Members of Utah Tar Sands Resistance and other environmental groups protest oil extraction from tar sands in front of the Chevron oil refinery north of downtown Salt Lake City, voicing concerns about damage to the environment, wildlife, and public health. Saturday, March 23, 2013. 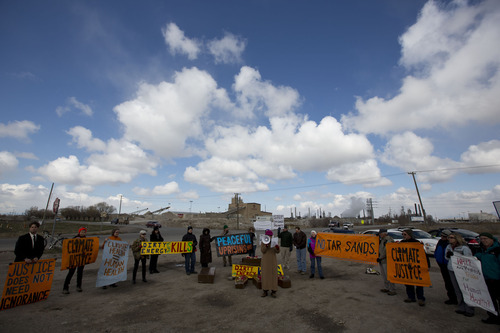 Lennie Mahler | The Salt Lake Tribune A crowd of protesters gathers at the gate of the Chevron oil refinery in Salt Lake City, demanding an end to oil extraction from tar sands, citing damage to the environment, wildlife, and public health. Saturday, March 23, 2013. Lennie Mahler | The Salt Lake Tribune Protesters march on a private road on 1100 W to the gate of the Chevron oil refinery in Salt Lake City in opposition to oil extraction from tar sands citing damage to the environment, wildlife, and public health. Saturday, March 23, 2013. Lennie Mahler | The Salt Lake Tribune Members of Utah Tar Sands Resistance and other environmental groups protest oil extraction from tar sands in front of the Chevron oil refinery north of downtown Salt Lake City, voicing concerns about damage to the environment, wildlife, and public health. Saturday, March 23, 2013. Lennie Mahler | The Salt Lake Tribune Members of Utah Tar Sands Resistance and other environmental groups protest oil extraction from tar sands in front of the Chevron oil refinery north of downtown Salt Lake City, voicing concerns about damage to the environment, wildlife, and public health. Saturday, March 23, 2013. 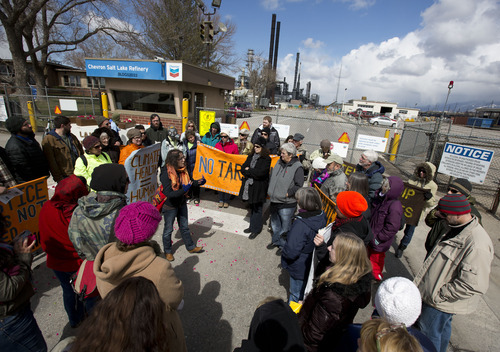 Lennie Mahler | The Salt Lake Tribune Protesters leave the Chevron oil refinery in Salt Lake City, voicing opposition to oil extraction from tar sands, citing damage to the environment, wildlife, and public health. Saturday, March 23, 2013. 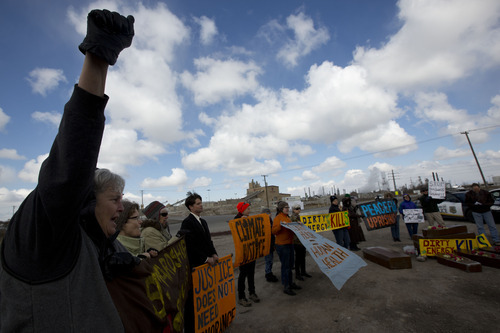 Lennie Mahler | The Salt Lake Tribune Protesters march to the gate of the Chevron oil refinery in Salt Lake City in opposition to oil extraction from tar sands citing damage to the environment, wildlife, and public health. Saturday, March 23, 2013. 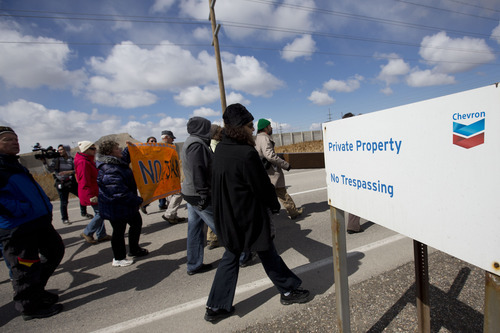 Lennie Mahler | The Salt Lake Tribune Will Munger leads protesters in a march to the gate of the Chevron oil refinery north of downtown Salt Lake City to protest oil extraction from tar sands. 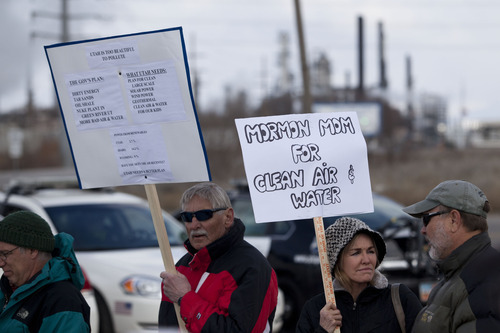 Protesters voiced concerns damage to the environment, wildlife, and public health. Saturday, March 23, 2013. 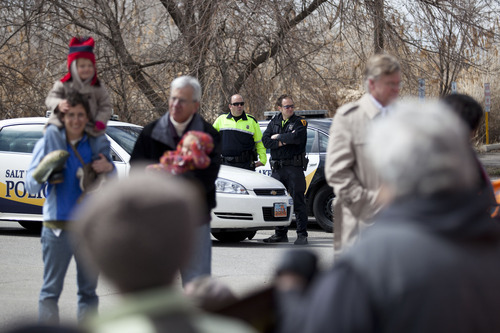 Lennie Mahler | The Salt Lake Tribune Police watch as protesters gather at the Chevron oil refinery north of downtown Salt Lake City, voicing concerns about damage to the environment, wildlife, and public health. Saturday, March 23, 2013. Lennie Mahler | The Salt Lake Tribune Raphael Cordray holds the megaphone as Ty Markham of the Mormons Environmental Stewardship Alliance speaks in protest of oil extraction from tar sands in front of the Chevron oil refinery in Salt Lake City, voicing concerns about damage to the environment, wildlife, and public health. Saturday, March 23, 2013. Lennie Mahler | The Salt Lake Tribune Members of Utah Tar Sands Resistance and other environmental groups protest oil extraction from tar sands in front of the Chevron oil refinery north of downtown Salt Lake City, voicing concerns about damage to the environment, wildlife, and public health. Saturday, March 23, 2013. Lennie Mahler | The Salt Lake Tribune Members of Utah Tar Sands Resistance and other environmental groups protest oil extraction from tar sands in front of the Chevron oil refinery north of downtown Salt Lake City, voicing concerns about damage to the environment, wildlife, and public health. Saturday, March 23, 2013. 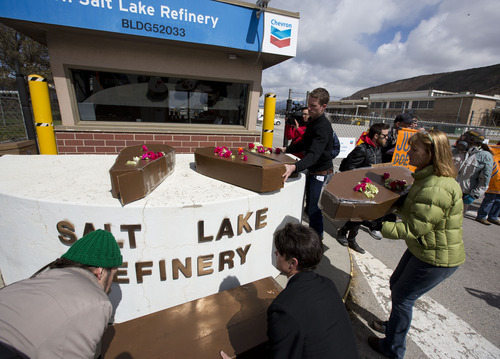 Lennie Mahler | The Salt Lake Tribune Carma Logie and Denise Davis set up a display of coffins and signs protesting oil extraction from tar sands in front of the Chevron oil refinery north of downtown Salt Lake City. 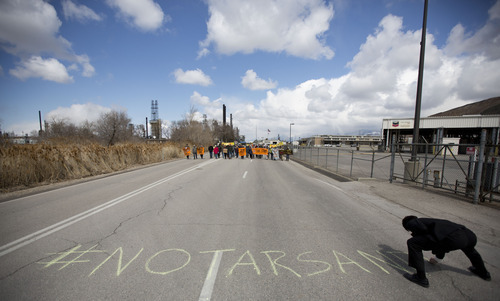 Members of Utah Tar Sands Resistance and other groups voiced concerns about damage to the environment, wildlife, and public health. Saturday, March 23, 2013. 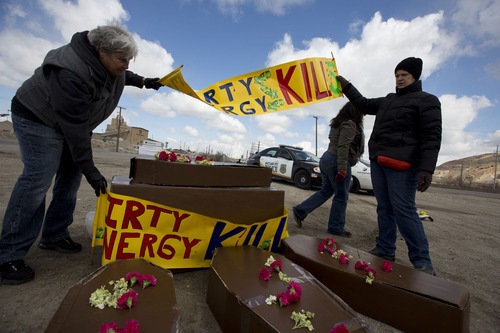 They carried cardboard coffins and waved banners that screamed "Dirty Energy Kills" and "Stop the Tar Sands Insanity." 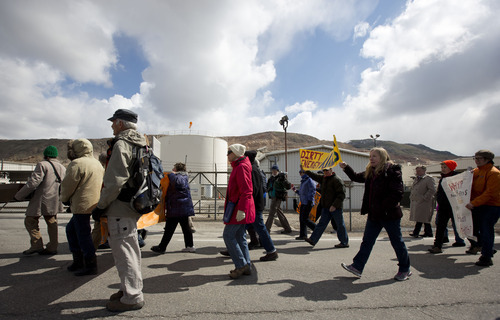 Some 60 hearty souls braved brisk March breezes Saturday to march one-third mile up a private road to Chevron&apos;s Salt Lake City refinery. They protested tar sands development in eastern Utah and criticized the oil giant&apos;s processing of Canadian crude from Alberta tar sands. Later Saturday afternoon, however, a spokesman for Chevron said that although the Salt Lake City facility does refine Canadian crude from Alberta tar sands, it is not involved in the eastern Utah project and has no plans to refine oil from Utah tar sands. "We are not a partner in that project," said spokesman Greg Hardy. He had no further comment. 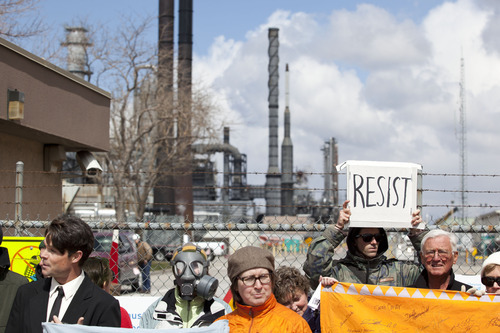 The rally was sponsored by the 2-year-old Utah Tar Sands Resistance organization. Also on hand were representatives from a handful of environmental organizations who decried tar sands as "dirty energy." Tar sand is made up of sand, clay a heavy black viscous oil, called bitumen. Tar sands can be mined and processed to extract bitumen that can them be refined into oil. One of the organizers Saturday&apos;s rally, Bart Tippetts, said because tar sands contains high levels of sulfur, lead and other carcinogens, refining it spews more poisons into Salt Lake Valley. In January, Salt Lake City earned the distinction of having the nation&apos;s dirtiest air. 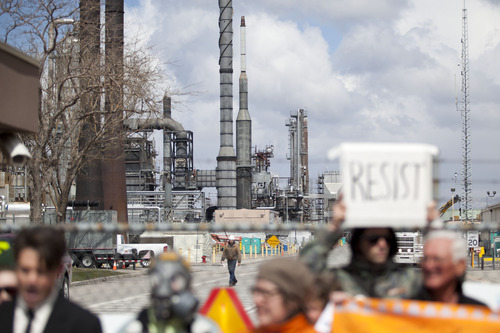 Another Resistance member, Raphael Cordray, said the group wanted to bring public attention to the Utah&apos;s tar sands project because the state government is too lax when it comes to environmental regulations. "The state of Utah is business friendly," she said. "It has put the fossil fuel industry ahead of the health of the people of Utah." A number of protesters pointed to the recent Willard Bay Chevron pipeline spill and two others that have occurred in Salt Lake City within the past three years as evidence that the oil company is not a good neighbor. Ty Markam, from the newly formed Mormon Environmental Stewardship Alliance, said her young group already has about 1,500 members, who are standing up for clean air and a clean environment. By nature, she said, Mormons are not street protesters. "But the LDS people are saying enough is enough." Will Munger, who spearheads an organization called Canyon Country Rising Tide, said in June he will host a training camp for people interested in blockading the P.R. Springs tar sands development. He led the protesters in a chant: "All night, all day, tar sands blockade." Salt Laker Sandra Biel said she attended the protest because she is fearful of what Utah&apos;s dirty air is doing to her health and that of her children. 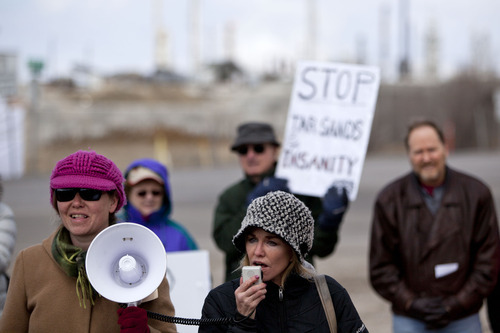 "My hope is that people will see us on the news and check out and see what is happening with tar sands," she said. "My hope is they will stop the tar sands project in Utah."